I hope you are comfortable because this is a long one, but not as long as the day I’ve just had. 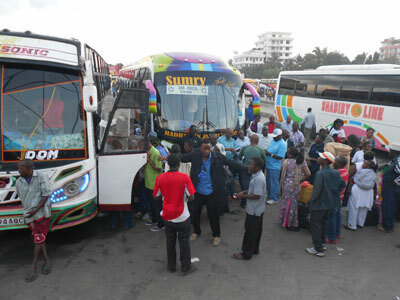 I flew into Dar as Salaam airport last night at 9.30 and having been transported to a hotel for the night by Karim (Cliff’s taxi driver mate), I was up this morning at 3:30 to get organised for my bus journey to Pangani. Breakfast of fried white of egg (? ), hotdog sausage and dry bread and I was ready to face the world as Karim picked me up at 4.45 for the run to the bus station. I imagine Victoria in London is daunting for a non-english speaker but believe me it has nothing on Ubungu Bus Station for giving you a quick blast of a different culture. Imagine the coach park at Wembley (if you’ve been)but many times bigger, with row upon row of coaches, nose to tail and barely a shoulder’s width apart. Each one with a ‘salesman’ convincing any of the thousands of people passing by that his is the best coach in the world. All this and it is still one hour before dawn. I had to wait until dawn, when some of the buses had already left, to take the pictures. I hadn’t seen another Muzungu (white man) and didn’t think it was polite to start using a flash camera to draw further attention to myself. Thankfully I still had my mentor, Karim, with me and we finally settled on a bus to Tanga for the sum of TzS 12,000 (about £5). A bottle of water for the journey and I was settled. Settled that is, until my neighbours arrived. The buses have five seats across their width instead of four (a two and a three, obviously to increase income by 25%), and I was next to the window in a three. I was somewhat relieved then, when this rather portly lady appeared at the end of the row, to see hiding behind her skirts a young boy of about seven years old looking terrified at the thought of spending six hours crammed between his mother and this strange man. 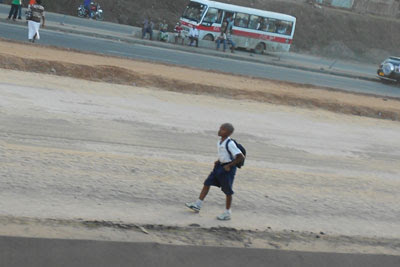 As we left the bust station (which took all of 30 minutes queuing) life was starting and at 7:00 amidst the dust and noise, the immaculately turned out school children were already about their walk to school. 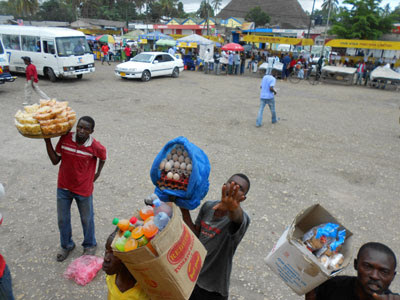 I never stop wondering that in a country of such low incomes and unemployment the school children are always a sight to behold in their freshly pressed shirts and shorts/skirts. Before I had left Dar I had seen uniforms of every colour of the rainbow and they all looked splendid. 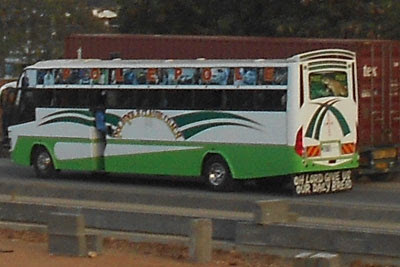 All the buses were covered with legends and mottos such as this reminder to the vehicle behind. We finally left the suburbs of Dar behind us started on the journey north. Any thoughts I had of flying along in air conditioned splendour on an inter-city trip were soon dispelled as we stopped at the first village to pick up more passengers. One of about twelve or more stops along the way, each one accompanied by the chance to buy bread, crisps, nuts, water, pop, boiled eggs, oranges etc. Surprisingly everything but toilets, as during the whole journey I never saw anyone get off and then get back on. 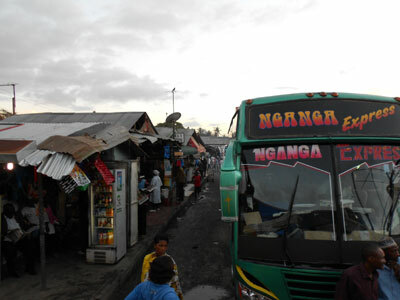 Eventually over eight hours after I had boarded the bus I alighted at Tanga bus station and without the help of Karim proceeded to walk around plaintively calling out “Basi Pangani”. 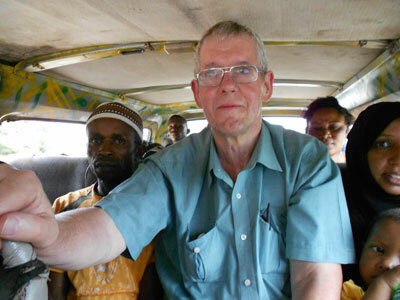 I had no need to worry though as a ‘very helpful’ young man grabbed my cases and pulled me towards an old minibus. I was too tired to argue or haggle but having seen my luggage on top and the fare paid, I still had energy to laugh when I realised that in fact all the seats were full and my seat was on a wooden box in the gangway. Thankfully this was only for the first twenty minutes until one of the other passengers got off and then I at least had a seat for the last ninety minutes of my journey along a very bumpy road. You can imagine I was pleased to see the sign Mkoma Bay and know I had reached my destination, although it still needed a little of my Swahili as the driver had forgotten my request and a shout of “Shoosha” was needed before he stopped. A phone call to Denis, my friend and contact in Pangani, and he arrived to help me with my cases for the last 300m away from the road to Pangani YMCA. Life certainly started looking up, but that is another tale……..